Bullion is a precious metal, such as gold, silver, platinum, or copper that is in its purest form. The alloy of silver bullion is typically 99.9% or 99.99% pure, and includes plain bullions bars and rounds or US Mint coins such as the American Silver Eagle. Bullion coins are not intended for circulation, but are minted for investment and collecting purposes. The difference between a coin and a bullion round is normally indicated by who minted the coin. Bullion coins or proofs are minted by the United States Mint or another government mint, and are backed by their government as legal tender. 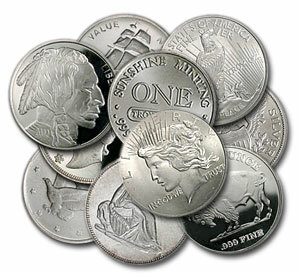 Silver rounds are minted by private mints and have no face value. These bullion rounds are normally issued for investment purposes only, and must not be minted with the same design as US-minted products. Bullion rounds could be used for fraudulent purposes if they visually matched legal tender. Bullion rounds are often produced as plain metal bullion, but many private mints create bullion rounds with particular designs that identify the mint. Some rounds are embellished with artwork depicting famous people, geographical locations, historical events, and many other miscellaneous designs. Bullion rounds do not come in special packaging or have any particular minting identification except for the logo or design of the private mint that produced them. Many refineries that recycle scrap precious metals, metals leftover from industries such as medical groups, dental applications, electronics, and more, produce bullion rounds that are then purchased by investors. Because these bullion rounds are not graded or regulated by numismatic organizations, consumers must be aware of the producing mint’s reputation and quality. Bullion rounds sell for less than government issued coins, and their price depends on the precious metals market prices at the time of purchase. Bullion rounds should have the markings indicating the mint or refinery that produced it, the purity, and the weight. Be leery of bullion rounds with no markings at all. Although these rounds are meant more for investment, there are coin collectors that do collect bullion rounds for their design and mint location. But much like junk silver coins, all bullion rounds allow for the best investment in precious metals because they can be bought closest to the spot price. A spot price is the value of a precious metal without any additional premiums or fees. Many private bullion round production companies are creating bullion rounds that are intrinsically appealing and look more like bullion coins. Some bullion rounds are made to look close to US Mint certified proof coins such as the popular American Silver and Gold Eagle proof coins. Consumers will know they are bullion rounds instead of coins by the lack of a face value and the differences in markings and mint designation. Bullion rounds are not created with the same intricate process of proof coins and may be damaged, worn, or have a rough surface. Still, they maintain their worth based on the precious metal purity, rather than the design and artistic value.